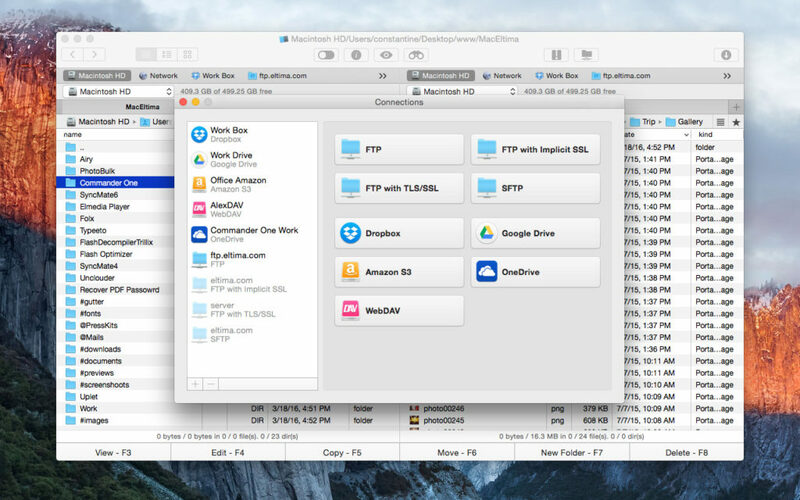 Looking for a multipurpose file manager, advanced finder replacement, FTP client or dropbox mounter for Mac OS? Well, the premium version of Commander One from Eltima software can do that all. Even the free version has a better functionalities than the default Mac finder, and offers a dual pane file manager. As you can see from the above screenshot, there's literally lots of options to fiddle with, also special shortcut keys to manage certain operations quickly. Let's talk about the features of Commander One. As it's programmed with the swift language, it blend very well with the Mac OS user interface. The icons, context menu, navigation icons and menu options looks pretty smooth and well placed. As it's a dual pane file manager, managing or copying files from any external device like iPod, digital camera, etc. etc. is very convenient. 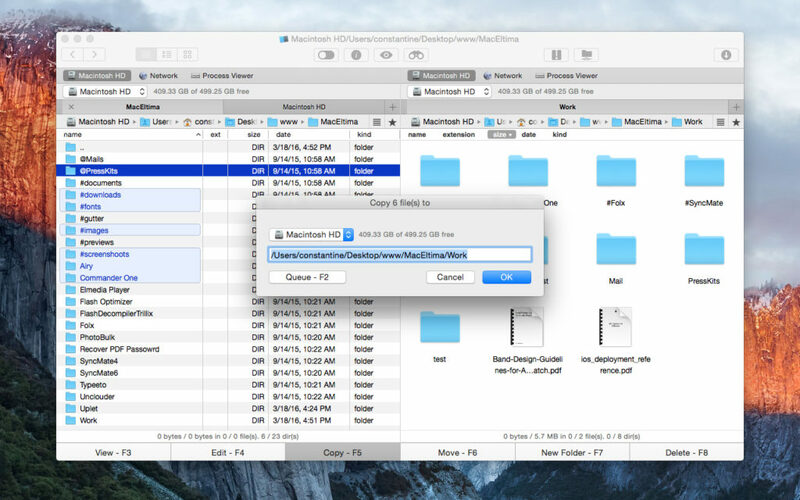 You don't have to open up two separate file manager window and switch between them. The search function is certainly better than native one from Mac OS. Supports searching by Regex or by different file types, also supports advanced Spotlight search. 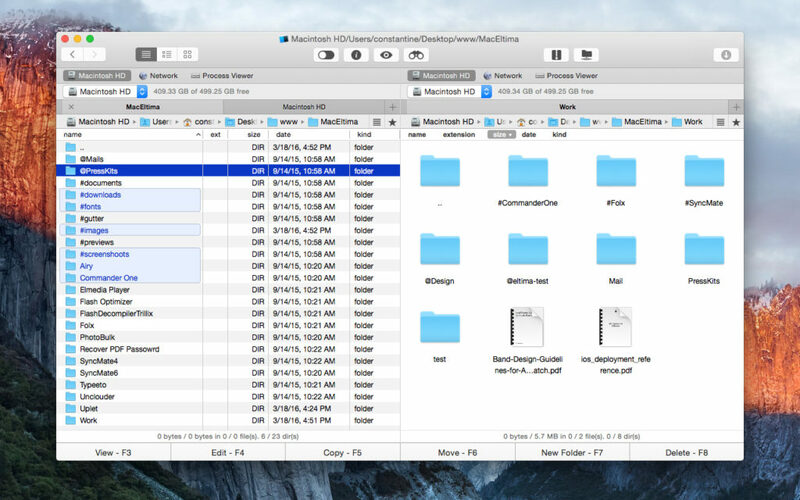 Here's a list of the features of the free version of the Commander One file manager. Custom Fonts & Colors, choose whatever suits your choice best. History and Favorites, to easily find out your previously searched files. Hotkey customization, different custom actions can be set. 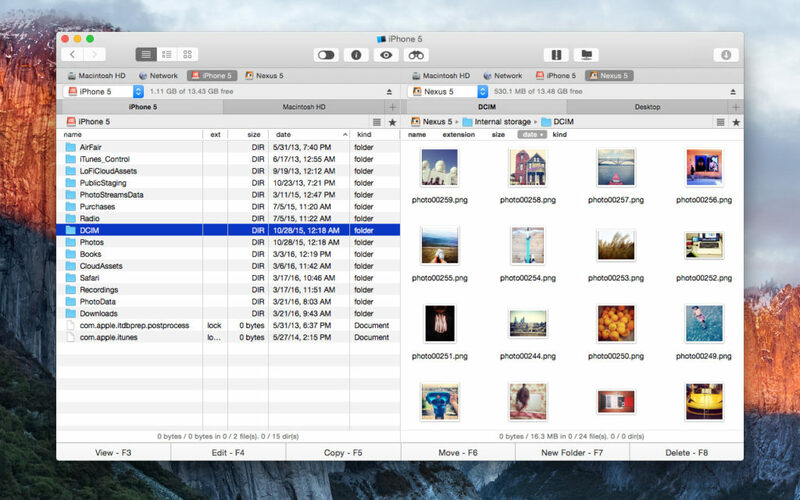 Unlimited tabs for better file management at a glance. Convenient items selection to select only those files you want to work with. File operations queue, you can queue the operations manually. ZIP file support, you can create or extract ZIP archives on the fly. Built-in file viewer to quickly take a look on text files, pictures or HTML documents. List of Computers in local network, supports SAMBA and other file sharing services. Root access to modify the files owned by the root account. These advanced features are only available with the premium licence. However you can try it for free for 15 days to evaluate. FTP Manager, access files on remote server via FTP or SFTP. Dropbox support, mount your Dropbox account as a local filesystem. Google Drive support, just same as the Dropbox mounting feature. Amazon S3 support, similar to Dropbox and G drive. OneDrive support, want to access your Microsoft One drive locally? No problem. WebDAV protocol support to enable file transfer over HTTP between the client and web server. 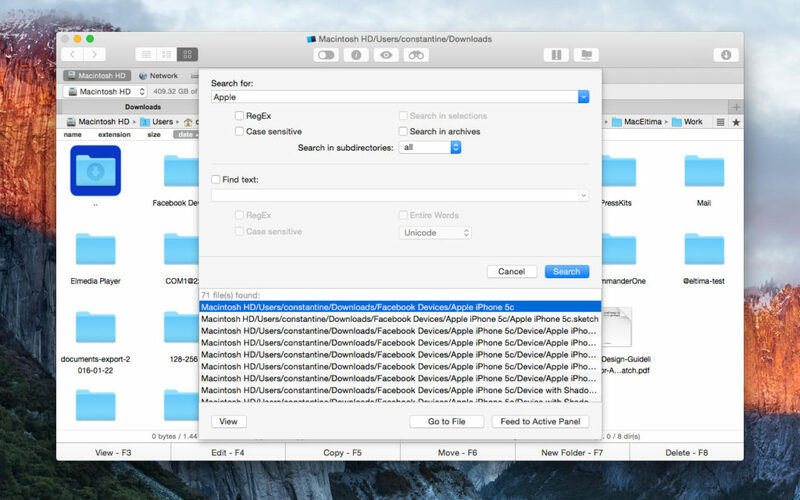 Mount iOS devices to copy files back and forth. Mount MTP enabled devices like Android phones and Digital Cameras to copy files. Open up Terminal Emulator to quickly do some command line stuff. Process manager to easily find and kill various process. Archive manager integration to easily create and extract ZIP, RAR or TAR files. Themes to customize the interface color according to your choice. It's one of the very basic tasks you always do, there's no need of explanation. However just for demonstration purpose, a screenshot below to show the file copy or move operation. S I've said earlier, it's dual pane and you could open up multiple tabs, very convenient for moving files across different folders or drives. You could use Commander One as a FTP client easily, here's a little demonstration. First you need to name your FTP connection, next enter the server's host name or IP address and the port, as it's FTP the default port is 21. The next step is to set your login credentials, namely username and password. If anonymous login is enabled to your server, just check the Anonymous login check box. You could also set the remote FTP path if you wish to login to a particular directory. After setting up everything, just hit the connect button, if everything was done right, you should be able to access the files on the remote server via FTP. It's also very simple, just plug in your iOS device, and it should automitacally show up on the connected devices section. And example with a iPhone and Android phone. Note that you can mount any MTP enabled devices with this feature. However only available with the Pro version of the software. Even if you're not willing to pay for the premium version, the free version packs enough features to give it a try, specially as a dual pane file manager. It's a perfect replacement for the popular total commander file manager for Windows. I'm specially liking the queue feature while copying multiple files. Undoubtedly the premium version's ability to mount various cloud storage services like Dropbox or Google drive justifies it's price point. With the premium version of Commander One, you won't need any other file archiving utility to create or extract ZIP, RAR, 7ZIP or TAR archives. So, that's all about Commander One, the free version definitely deserves a try. Also don't forget to visit the official website to discover more interesting utilities for Mac OS.